March 1, 2012 | Category Newsletter, Stretches. Place your arms directly out to the sides at shoulder height with your palms down. Imagine someone is pulling on each arm so that you feel a slight distraction from the shoulder joints. 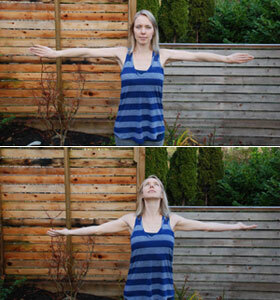 Slowly rotate your outstretched arms forward, keeping them at shoulder height. You should feel a stretch throughout your arms and into the backs of your shoulders. After feeling a few releases in that direction, you can rotate your palms up and back opening up the fronts of the arms and your chest. You can look up to open up the front of your neck as well. Take a few breaths here and then release slowly.